The smaller babies, the greater stroller they need. That’s why baby prams – strollers with bassinet – are the perfect solution for newborns and infants, especially if parent love long-distance strolls. 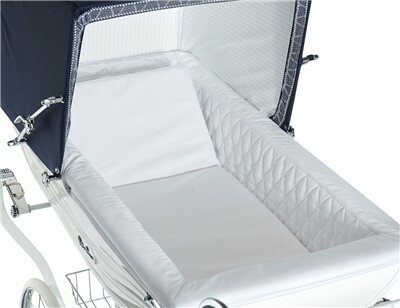 Only the bassinet provides fully flat position which gives perfect support for the infant’s back. It is the best position for baby’s delicate spine and head, since they lack neck control. Today modern prams are very different from the ones that were on the market 20 or 30 years ago. The choice is really vast. You can choose a modern pram that looks old-fashioned and comes only with the carrycot. 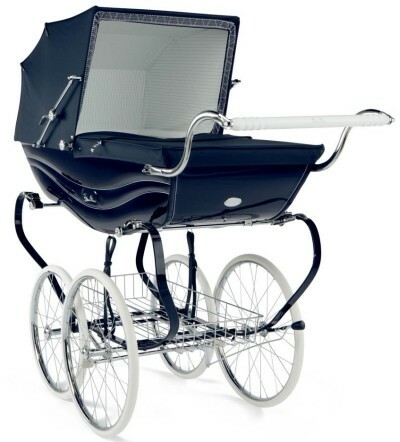 There are also strollers with bassinet which can be switched for a toddler seat, as the baby grows. Finally, there are strollers with convertible 2-in-1 seat: regular toddler seat that reclines flat and converts into a bassinet. 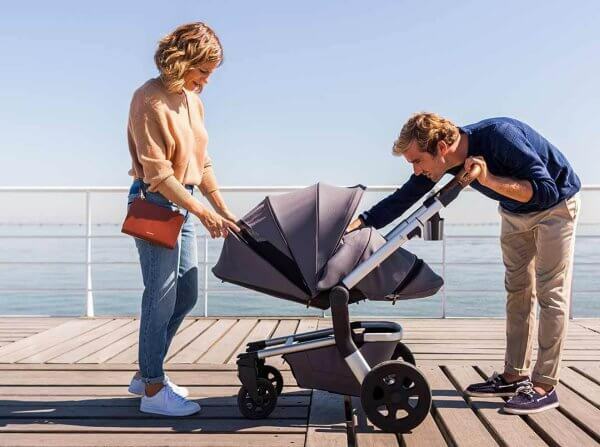 I know that as a loving parent you want the best and safest stroller for your little one, therefore I created this ranking of TOP prams for 2019. These are not only my favorite models, but they are highly-rated by hundreds of parents as well. If you’re looking for a stroller with bassinet for your newborn baby these prams are the best options right now. Ultra-safe infant car seat – included! 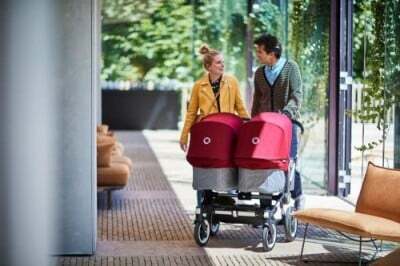 In this ranking I present you modern prams: best strollers with bassinet, prams that look old–fashioned and strollers with convertible 2-in-1 seat. This is one of the best strollers with bassinet in a medium price range. It is 2-in-1 stroller and comes not only with a bassinet, but also a separate seat unit with capacity of 40 lbs. 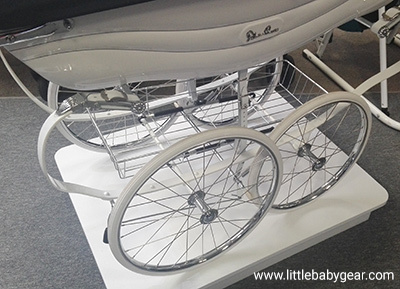 Roan Rocco Classic Pram can be used from birth up to about 3 years. You can attach to the stroller the bassinet or regular seat for a child who can sit unassisted. Let’s take a closer look at the bassinet features. It is quite spacious (31.5″ long and 14.7″ wide) it offers comfortable place for sleeping newborn. Thanks to completely flat surface the bassinet is safe and suitable for a baby during first few months, considering his spine development. There is also large canopy and removable apron that protect baby from sun and wind really well. The canopy provides also nice ventilation thanks to mesh part that can be uncovered on hot summer days to protect baby from overheating. Roan Rocco with bassinet is one of the best newborn prams available in 2019. The bassinet can be used since day one for about 6-8 months. Its weight capacity is 19.8 lbs. 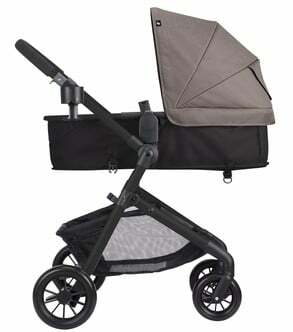 As for a pram Roan Rocco has really nice modern look and it’s really multi-functional. It has 12.5″ wheels with air-pumped tires. Keep in mind that the wheels are locked and don’t feature swivel option. There is also a suspension that cushions the ride, but remember this is not an all-terrain stroller. It works on sidewalks, pavement, gravel paths, but it’s not designed for wooded trails and sandy beaches. It can also handle snow so you can easily use it all year around. I like that it has adjustable rotating handlebar – it goes from about 27.5″ up to 43″. Therefore this pram stroller is convenient to push even for very short and very tall parents. There is also a metal basket under the bassinet/seat unit. It’s not very deep so it’s not suitable for storing small items, but it can hold a large diaper bag or few shopping bags. 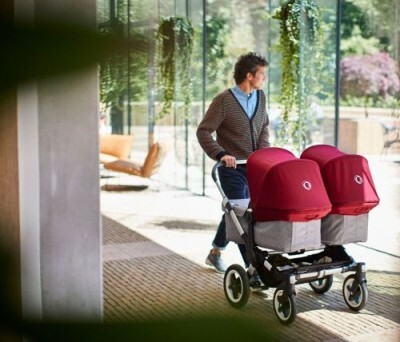 This is a ranking of the best baby prams, so I will only mention few words about the regular seat that is included with Roan Rocco Classic Pram. The back rest can be adjusted to 3 different positions. Thanks to really deep recline the baby can comfortably nap during strolls (not only infant like to nap on-the-go, it’s crucial for toddlers as well). Footrest can be also adjusted as the baby grows. There is also 5-point harness. I love that the regular seat can be facing parent or forward: it’s good to have an option of rearward facing for keeping an eye on younger infant and option of facing the World for curious toddler. You can fold the stroller with the regular seat attached or you can fold the chassis itself. The is one more advantage of this stroller. For a medium price range model it’s really well equipped. It comes with chassis, bassinet with mattress, apron and all-weather cover, regular seat unit with footmuff and a diaper bag. However there is one thing that I don’t like about Roan Rocco Classic Pram – it weighs about 33 lbs. It’s not cumbersome, but it’s definitely on the heavy side. 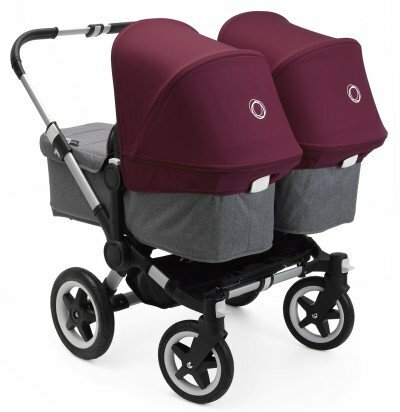 Roan Rocco Classic Pram comes in few color versions which have slightly different price. You can check available colors and compare their prices at Amazon. I always check customer reviews before I decide to buy a product for my babies and Roan Rocco Classic Pram was no exception. I checked it at Amazon and I was stunned with its rate – it had over one hundred reviews, including almost only positive ones (check the current number of reviews)! It’s a remarkable result. This pram stroller is not only very popular, but also highly rated and recommended by many parents. Here are the features that customers mention most often. This stroller handles many types of terrain and some parents have even taken it to the beach. However, you should remember about cleaning the wheels properly when they get dirty from sand and salt. Also, if you have used the stroller during rain, make sure to dry the wheels properly. Otherwise they may start to squeak. 1. This stroller comes with many accessories: footmuff, insect cover, rain shield and diaper bag. And since you don’t have to pay extra for these items you can actually save some money. 2. It includes a bassinet for first few months and a toddler seat for baby who can sit, therefore it can be your only stroller. 3. It’s well-designed and made of high-quality materials so you can be sure it will serve you for a long time. 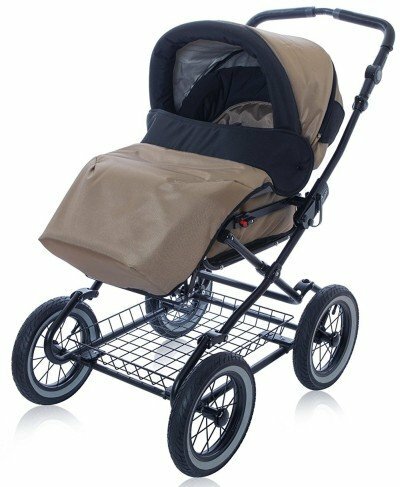 This is an inexpensive stroller with bassinet option. It’s truly 3-in-1 stroller – it not only comes with an infant car seat and regular seat, but it also converts into a pram. Evenflo Pivot Modular includes a seat that is suitable from birth up to 50 lbs. This seat features multi-position recline with fully flat position. You can not only recline the back rest, but also lower the whole seat unit to create a bassinet. I love that the seat is convertible and offers two seating options. Thank to that you can use this stroller since infancy to toddlerhood – first with a bassinet and then convert it to a regular toddler seat. However, you have only one piece of baby gear to store! It’s perfect option for parents who want to have stroller with bassinet option, but don’t have lots of free space at home. The seat (and bassinet) is reversible so your child can ride facing you or the World. You can adjust it, depending on baby’s age and mood. There is 3 or 5-point harness and 3-panel canopy which provide decent amount of shade. Good thing is that it has peek-a-boo window so when the baby is facing front you can easily check on him. I love that this window is silent and made of mesh so it can provide extra air-flow for the baby on hot days. I also like the soft seat padding and removable bumper bar. 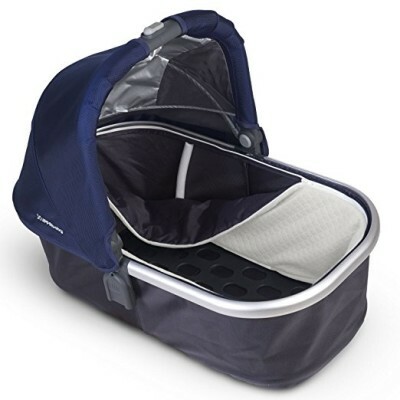 Underseat basket can accommodate large diaper bag and it’s very easily accessible – LOVE IT! The handlebar is not adjustable, it is fixed at 40″ from the ground. The wheels are rather small and have Cruiser Tires. They work best on flat terrain like sidewalks, pavement, asphalt, even gravel and indoor surfaces (at the mall or airport). It’s not an all-terrain stroller, but it’s perfect for city use. Oh, and there is one more seating option that you can use from birth – this is a travel system and it includes SafeMax Infant Car Seat which safety features are confirmed by many tests. 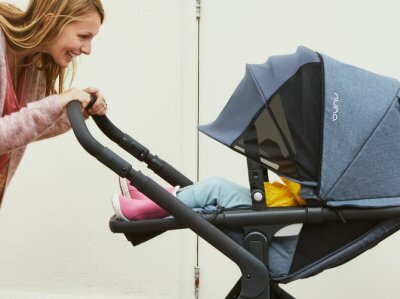 I included Evenflo Pivot Modular Travel System in my ranking of TOP Travel Systems for 2019 so here I focus mainly on the bassinet option. If you would like to learn more about this stroller I invite you to read my in-depth review. Every time I check this cheap stroller with bassinet option at Amazon it has more and more customer reviews. It’s getting incredibly popular. In the table below you can check the major advantages and disadvantages that other parents mention. You can also skip to Amazon and read the customer reviews on your own. You can use the bassinet option only when it’s attached to the stroller frame. When you detach it, it will collapse. 1. Thanks to 2-in-1 convertible seat this stroller is a space-saver. 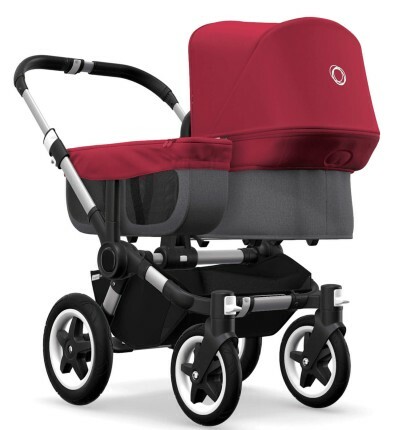 Perfect choice for those who love prams but have small apartment and/or small car. 2. Although it’s one of the cheapest strollers with bassinet option, the quality and features are like in high-end products. 3. It comes with excellent infant car seat, car seat base, cup holder and child tray so you don’t have to spend extra money on these items. 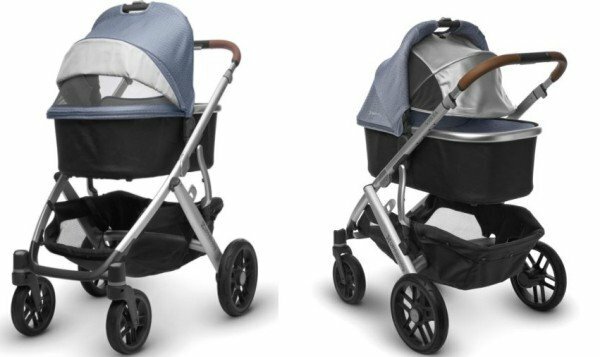 UPPAbaby VISTA is one of the best strollers with bassinet on the market right now. It has high price tag, but it’s totally worth the price. The bassinet is included with the stroller and there is also rain shield and bug shield for it. Thanks to proper depth and ventilation, it is approved for overnight sleep, if you use it with the stand. Here are the main features that make it one of the best bassinets for 2019. There is removable perforated mattress pad and vented base which provide nice breathability and comfort for sleeping baby. Moreover, the inner liner is water-repellant therefore it keeps the sleeping surface dry so the baby could always feel comfortable. The liner and canopy cover zip out so the bassinet is very easily to keep clean. And the best part is the canopy – it has extendable sun visor with UPF 50+ which provide full shade from harmful sun rays. Your baby can sleep undisturbed and you don’t have to worry he will overheat – there is mesh part on the canopy which you can unzip to provide additional air flow. It can be actually the best pram for newborn in 2019. UPPAbaby VISTA comes also with regular seat suitable from 3 months. One-hand deep recline is excellent for naps on-the-go, while the canopy provides great coverage from the sun. There is peek-a-boo window with magnetic closure, which I love. Telescoping handlebar makes pushing super convenient for parents of all heights. The wheels and suspension are great for city use (pavement, gravel, grass, indoor surfaces). And there is ENORMOUS basket that can hold up to 30 lbs of parents necessities. 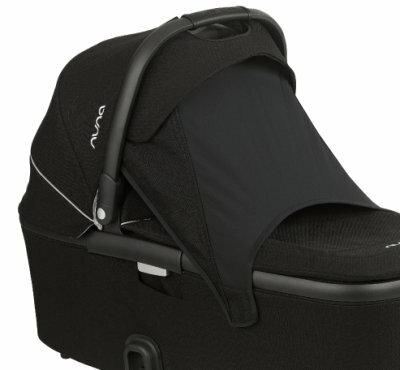 VISTA can be also used as a travel system with awesome MESA infant car seat (no adapters needed) or few other car seat from different brands (with adapters). 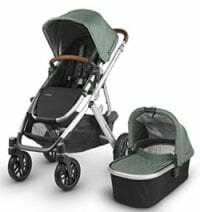 I included UPPAbaby VISTA in my ranking of the best convertible strollers and best travel systems for 2019, therefore here I focus mainly on the bassinet. If you want to learn more about this stroller check out my full review of VISTA. Of course I checked this stroller at Amazon as well – VISTA has served me and my kids really well for a long time but I wanted to make sure other parents are also satisfied with it. 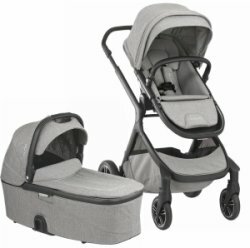 This stroller has almost only positive reviews and really high rate (check the current numbers here). What parents like about it the most and what are the main drawbacks? To use it for overnight sleep you will need the stand for bassinet, which is an additional cost (check the UPPABaby Stand). Also, keep in mind that different color versions of UPPAbaby VISTA have different prices. You can save quite a lot of money on some colors actually. To check the latest price for different colors I recommend you to visit Amazon. 1. This bassinet provides comfortable and safe position for newborn baby and supports his delicate spine, neck and head. It’s perfect choice for parents who like to go for long strolls with their newborn. 2. This stroller gives parents lots of flexibility since it has plenty seating option for one, two or even three kids. 3. According to many parents this stroller is TOP-QUALITY and built to last – totally worth the money. This is one of the modern and stylish strollers that is newborn-ready. You can use it right from day one, with bassinet (sold separately) or with the cocoon attached to a fully reclined seat. You decide what’s more convenient for you! This stroller has tons of features you’re going to love. The seat has 3-position recline and the lowest position is truly flat so it’s suitable for a newborn baby. The footrest is also adjustable. If you recline the backrest all the way down and flip up the footrest, you will have an infant-ready mode. To give your little one more comfort and support during the first six months Joolz has designed a special newborn cocoon with built-in footmuff (YAY!) that easily attaches to the flat seat. So even without the bassinet, you can use this stroller from birth – just like a pram! Joolz cocoon has a breathable mattress and integrated mesh windows to keep your baby from sweating and overheating. It creates a sheltered and cozy place for a sleeping newborn and protects them from wind. As we’re talking about the weather I have to mention the canopy which is literally A M A Z I N G.
It’s huge and has additional, fourth, mesh panel that opens with a zipper. When the hood is fully extended it shades the baby from head to toe, regardless the recline position! If your babe hates having sun in their eyes, you’ll be thrilled with this canopy. If you’re a fan of bassinets (like I am) or simply love long-distance strolls, I recommend you adding to your Joolz Hub a bassinet. It provides the best and most comfy position for a newborn baby. With a big, vented canopy and apron your little one is protected from weather and can sleep soundly. You’ll also love how easily it is to switch between different seating options – the seat removes from the frame effortlessly and the bassinet attaches in the same spot with one simple click. How often will you use it during the first 6 months? Will you use it for long strolls or just for running quick errands? If you plan on going often for long walks with your newborn baby, the bassinet is a better option because it’s more comfortable for the baby for longer periods. Of course the bassinet is more expensive option. At Amazon you can compare the prices: bassinet vs cocoon. If you have more flexible budget – go for the stroller with bassinet. 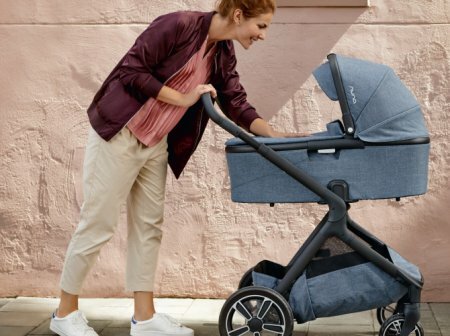 But if you’re on a tight budget or plan on using the stroller rarely during the first few months – the cocoon will probably work better for you. Now I’d like to tell you a bit about other features of Joolz Hub. The whole stroller is a breeze to push and steers effortlessly with one hand. It’s only 20 inches wide so it fits in narrow spaces and turns easily even in tight corners. What types of terrain Joolz Hub can handle? It’s a city stroller, but works really well on grass, gravel and uneven surfaces too. It doesn’t stuck on cracks on pavement or tree roots and sticks in park (but for that you need to lock the front wheels!). On bigger bumps it may wiggle a bit, but generally speaking the ride is smooth and visibly cushioned. It has roomy storage basket with clear and easy access (Joolz is famous for that). On the handlebar you can also find hooks for a diaper bag. This brand really knows what mommy needs! One thing you should keep in mind – folding takes a few steps and you will need two hands to pull triggers on both sides of the handlebar. But all in all, the process is easy and you’ll get used to it very quickly. Big plus for Joolz for including a carry strap. The stroller itself weighs about 25 pounds so it’s fairly easy to lift it to the car trunk. Folded dimensions are 26″ x 21″ x 13″ so it will probably fit in most medium sized trunk with ease. I did some online research and found out that parents really love Joolz Hub and its bassinet accessory. Below you can see my summary of customer reviews that I found at Amazon. If you’d like to check them on your own, just click here. The bassinet, as well as the newborn cocoon, are sold separately. So you if want to use this stroller from birth and would like to have a pram-looking stroller, you need to pay extra. It’s one of the most expensive prams. 1. The stroller is intuitive and user-friendly. Switching between the bassinet and toddler seat, reversing the seat, folding – all is super easy. 2. The bassinet is just an option. This stroller is actually newborn-ready because the seat reclines flat and accepts a cocoon (cheaper than bassinet). 3. 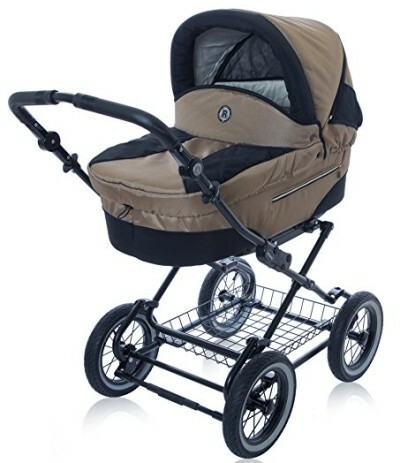 This is a luxury pram and looks very trendy and elegant. 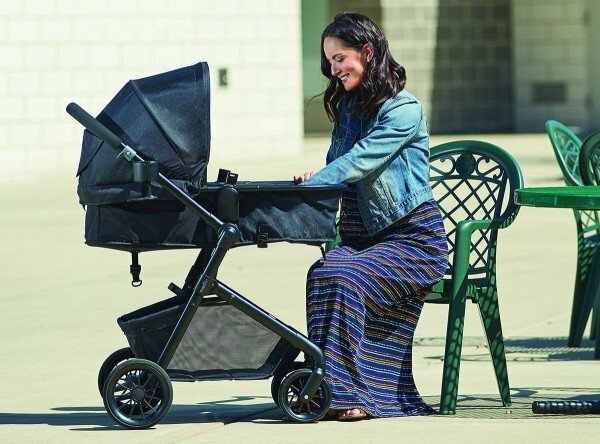 This high-end stroller doesn’t come with the bassinet included in the basic set, but I decided to include it in my ranking of the best baby prams anyway. Why? Simply because of the bassinet’s amazing features. 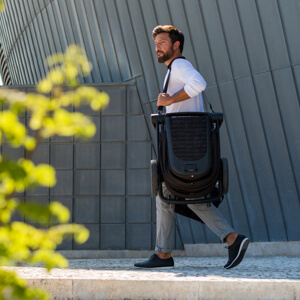 Nuna Demi Grow is an expandable stroller that converts from a single to a double mode. 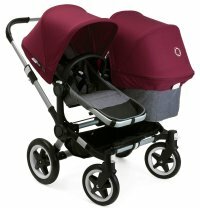 Although it’s has some drawbacks as a double stroller, it works excellent as a pram with the additionally purchased bassinet. Here are the things you are going to love about Nuna Demi Grow as pram stroller. Demi Grow bassinet attaches directly to the stroller frame. Everything works very smoothly and clicks easily in the right spot. This bassinet is equipped with a roomy canopy and apron that together provide sheltered place for a newborn baby and give nice protection from the sun and wind. Moreover, the canopy has flip out sun visor and integrated mesh panel that provides extra air-flow. Therefore your baby won’t be sweating and getting hot in it. And if you ever want to give your baby more privacy during the nap time or keep the sun out of their face, there is also Dream drape. It fully shelters the baby and allows them for undisturbed sleep. It’s also a perfect solution when you want to protect your baby from glances of curious passersby. You’re probably wondering if this shield doesn’t block air circulation making the interior of the bassinet too hot. You don’t have to worry about it at all, because the Dream drape is made of a breathable fabric and has mesh side windows. Another fantastic thing about Demi Grow bassinet is that it’s approved for overnight sleeping. Why is it such a great news? Well, it means that Demi Grow baasinet is a perfect bed for a baby during travel. Not all parents like using portable travel cot, therefore bassinet is an awesome solution. Moreover, it folds flat therefore it’s easy to transport. It also simplifies storing (for example for the next baby). I love foldable bassinets – it’s really rare feature. Usually bassinets don’t fold and transporting them in a car trunk is sometimes impossible. With the Nuna Demi Grow bassinet it’s not an issue anymore! This is one of the best bassinets in 2019. There are three more functions that you’re going to love about this carrycot. It has a convenient carry handle and a storage compartment for few small necessities. The pouch is really handy and allow you to keep few diapers and wet wipes always within reach. And in case of a diaper blowout or spilled milk you’ll be able to remove the mattress cover, liner, as well as the top cover and toss it in the washing machine. As you can see Nuna Demi Grow is a fantastic baby pram. I really like strollers with bassinet because the bassinet provides the best and safest surface for sleeping newborn and it’s very useful for parents who love long-distance strolls. However, it’s good to have an option of travel system as well – for running quick daily errands and quick transition from the car to the stroller. 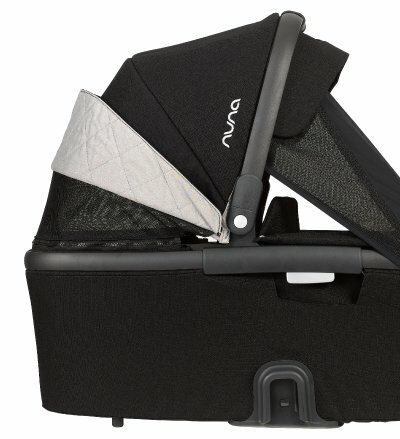 Nuna Demi Grow has option of travel system and it is compatible with all infant car seats from Pipa series: Nuna Pipa, Nuna Pipa Lite and Nuna Pipa Lite LX – they all attach directly to the stroller frame. Let’s take a quick look at other functions of the stroller. When the baby outgrows the bassinet and can sit unassisted you can switch it for a regular seat (included in the basic set) which can be installed rear or front facing. The canopy on the main seat is big and has additional Dream drape that covers baby knees or even feet! It’s incredible how far it extends. The back rest adjusts with one hand to few positions, providing comfortable place for naps. The calf rest is adjustable too. There is also a bumper bar which opens easily to make taking baby in and out of the stroller faster and easier. The seat is suitable for all seasons thanks to integrated mesh panels that you can unzip which is amazingly useful. If you live in a warm climate or your baby has tendency to sweat, you’re going to love it! There is also adjustable handlebar and the stroller can be pushed with one hand almost effortlessly. Nuna Demi Grow wheels are filled with foam – so no worries about punctures or loosing air. The rear wheels are really big, there is also custom dual suspension. This stroller is equipped with spacious storage basket that is easily accessible from the back. It can accommodate even a large diaper bag. Unfortunately when you expand Nuna Demi Grow into a double mode, the basket is basically useless. You can learn more about this issue (as well as other features of Nuna Demi Grow stroller) in my full review. If you’re still hesitating if this baby pram is best option for you and your little on, here’s my summary of Nuna Demi Grow advantages and disadvantages. When you decide to buy this stroller you have to be prepared for spending a lot of money, especially if you want to plan on adding another seating configuration for siblings. But it still may be a better option than purchasing two strollers or standard side-by-side double stroller. One more thing – there are few different color versions – the availability and price may vary, so make sure to check it before buying. Click here if you want to compare color and their prices. 1. 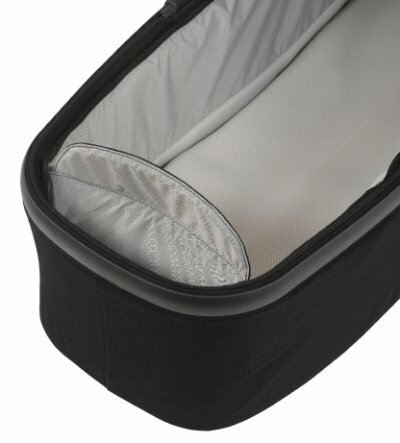 Thanks to foldable bassinet you will be able to easily store or transport it in the car trunk. 2. Bassinet and regular seat have awesome canopies that provide great coverage from the sun and nice air-flow at the same time. Therefore you don’t have to worry about sunburns and overheating. 3. 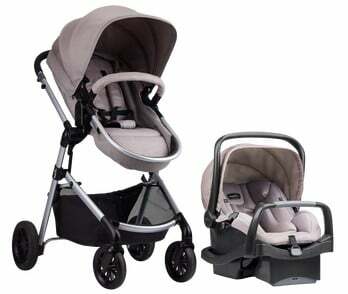 Thanks to travel system option and quick switching between seating option this can be your primary and only stroller. 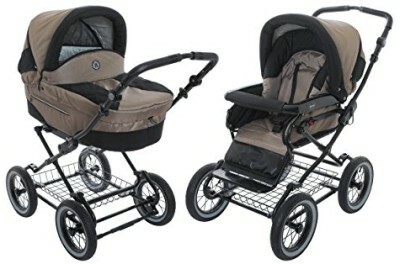 This is probably the best pram for twins available on the market in 2019. It’s also a convertible and expandable stroller which offers many more seating options. Let’s start with the bassinet features. First of all, the bassinets can be facing parents or the World (both in the same or different directions). I prefer the parent-facing option since the bassinets are designed for newborns and there are no peek-a-boo windows on the canopies, so there is no other option of keeping an eye on the little babies. Despite the lack of peek-a-boo windows, the canopies are really awesome. There are three extendable panels – one opens with a zipper. Fully extended canopy completely covers the baby. If you live in area with hot climate or if you like summer strolls and day trips – these canopies will be life-saving. Each bassinet has also removable apron – perfect for more chilly days to keep your little ones warm and comfortable. Bugaboo Donkey2 – the newest version of the stroller released last year has upgraded apron that fits the bassinet more tightly. There is also a convenient carry handle so you could easily transport your baby in the bassinet from a stroller to home. 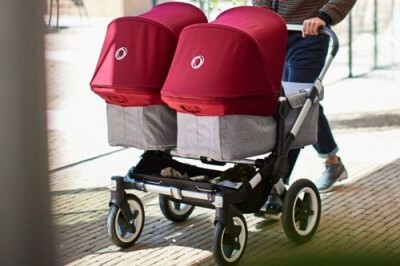 Thanks to these awesome bassinets Bugaboo Donkey2 is one of the best prams of 2019 (not only for twins, but also for one newborn baby). What’s really great is that Bugaboo offers also different canopy that has few mesh windows and you can extend it to fully cover the whole bassinet (or regular seat). Check this breezy canopy here. Let’s take a quick look at other features of Bugaboo Donkey2. It can be used with one or two bassinets, infant car seats or toddler seats or you can mix the different seats. It has new foam-filled tires that imitate the air-filled ones and provide ultra-smooth ride while you don’t have to worry about punctures or inflating. 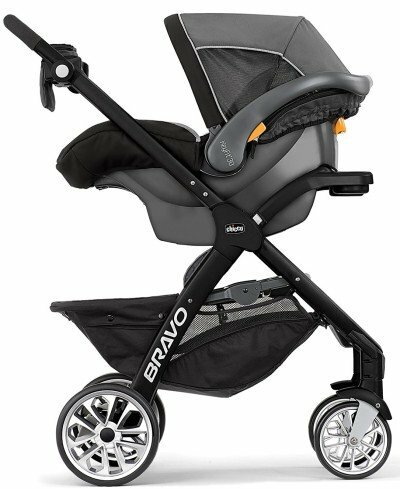 There is also suspension that cushions the ride and make the Bugaboo Donkey2 suitable even for rough terrain (but not jogging). The regular seat reclines and has large, extendable canopy as well. 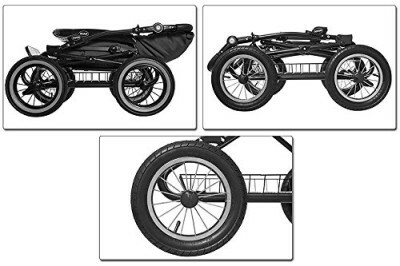 There is also spacious basket under the seats and in Mono version you can also attach additional side luggage basket. Bugaboo Donkey2 is available in many colors and you can actually customize the whole stroller and make it exactly how you like it. You can find more information about Bugaboo Donkey2 and original Donkey in my comprehensive review. Last time I checked this new version of Donkey didn’t have many customer reviews at Amazon yet (it’s one of the most expensive strollers so it may not be a best-seller). Parents say it’s a perfect choice for those who plan on having multiple kids. It easily glides through doorways and handles tight turn surprisingly well. Folding also works smooth. 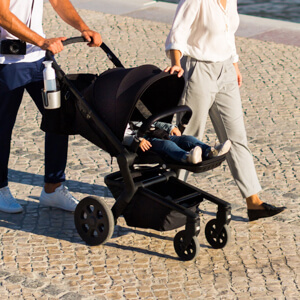 The stroller feels sturdy and thanks to big wheels and suspension you don’t feel any bumps when strolling over uneven terrain. The biggest problem with this stroller is its weight – it feels quite heavy when you are carrying it up and down the stairs often. You can check if there are any new reviews on your own – just click here. Bugaboo offers huge customization for Donkey2 and you can buy this stroller as a complete set or you can buy all necessary items separately (for example the bassinet is also sold in parts: the fabric, mattress, canopy and apron). Before you buy your Bugaboo Donkey make sure it comes with every part you need. And be prepared it will cost A LOT. 1. 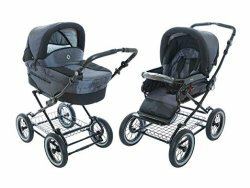 This is one of the best prams for twins as it gives parents ability to attach two roomy and comfy bassinets with awesome oversized canopies. 2. This stroller looks chic and fashionable. You can be sure you’ll get a lot of compliments. 3. It can be expand from a single to a double stroller and from a pram to a toddler stroller, therefore it really grows with the baby and the whole family. This is another old-fashioned, luxurious pram with big wheel. 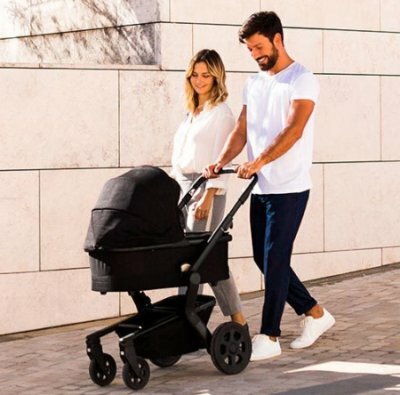 It’s probably the most expensive pram for newborn on the market in 2019. It is not a convertible stroller, it’s a classic pram that includes a stylish bassinet. By getting it you can be sure you get the highest quality, the most luxury look and perfect craftsmanship. The bassinet liner and mattress are padded with the best quality cotton. There is also adjustable headrest which can be very useful when the baby has reflux or is sick. This newborn pram is also equipped with a white leather harness that keeps baby safe and secured in place. The roomy canopy and apron protect baby from the sun and wind. However, I wish there was a sun visor or the canopy went further down to provide even more shade. Balmoral Pram has big wheels with spokes. There is also patented C-spring suspension that provides the little price or princess with smooth ride. Anyway, this pram is not suitable for all types of terrain – I wouldn’t take it of an off-road stroll. PRO TIP: Last time I checked this royal baby pram wasn’t available at Amazon, but I found it at PishPosh Baby (here). Under the bassinet there is a basket, very similar to the one that Inglesina Classica Pram has – it’s not deep but spacious and can easily hold even a large diaper bag. 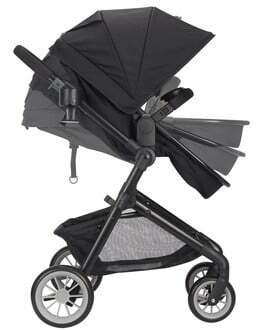 This luxury pram comes in 5 color versions: Black, Cream, Navy, Pink and White. This is the most pricey pram and single stroller with bassinet available on the market. It’s even a bigger expense if you consider that it can be used only for the first few months! You can check its current price and compare different color versions at PishPosh Baby. 1. This newborn pram is stylish and luxurious. You can be sure your little one will feel very royal in it. 2. Other moms will be definitely jealous of this beautiful pram and you’ll get lots of compliments. 3. It’s made of top-quality durable materials and comfortable fabrics to provide the baby with most safe and cozy ride. 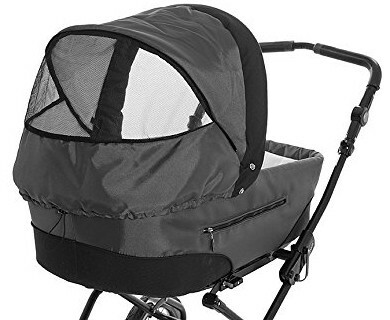 I know that when many future parents thinks about strolling with their baby through neighborhood, park or city streets, they imagine a stroller with a bassinet. When I was looking for my first stroller, I only considered buying this type! Many parents decide to use infant car seat frame because it’s easier to move from the car and house and you don’t have to wake your sleeping baby by taking him/her out of the car seat and putting into the bassinet. Of course you can also stroll with your little passenger sleeping in an infant car seat. It’s very convenient, especially if you often drive before going for a stroll or if you want to run some daily errands and often change between driving and walking. But remember that infant car seat is not proper for long rides. It doesn’t provide a proper position for sleeping newborn during long walk. According to some safety standards the infant shouldn’t be in the car seat longer than for 1 hour. In my opinion, both stroller options have some advantages and their very own application. Prams are better if you often go for long walks. Thanks to a bassinet baby lies flat and can nap comfortably. Infant car seat frame is a better solution if you don’t go for long strolls, but often run errands and drive a car with a baby. If you decide to buy a pram for your little one, you should choose big, roomy and comfortable bassinet. Your baby comfort is one of the most important things. Another key aspect is baby’s safety. Therefore you should check stroller’s stability, maneuverability and durability. 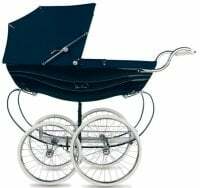 Many baby prams don’t have large wheels and such an amazing amortization like, for example, joggers, but you should look for the one with the best possible suspension system and wheels big enough for bumpless rides. Another important thing is the sunshade. It should be big enough to protect baby from the sun and wind and provide nice coverage. The best canopy is the one that is extendable, has a flip out sun visor and provides good air-flow. It’s really useful if the canopy has a mesh part with a cover – it’s perfect for summer strolls as it provides extra ventilation. You should also pay attention to the bassinet itself and choose the one that is big and roomy and offers proper stability. The mattress should be comfy and soft but also thick enough to provide support for baby’s back and head and protect baby from bumps and shocks. The padding on the mattress should be breathable – it’s very important so the baby won’t sweat and overheat. Couple years ago, when the choice of baby strollers wasn’t so vast, parents often bought prams as a first buggy and a small lightweight stroller as the second stroller for the baby. On the other hand you have a vast choice of convertible strollers, which are very popular and practical. Modern prams offer an option of installing bassinet, car seat or toddler seat (for example UPPAbaby VISTA and Roan Rocco Classic Pram) or have one seat unit that converts to a bassinet or regular seat (for example Evenflo Pivot Modular). As any other type of baby strollers, prams have many advantages, but also couple features that parents may not like. Here is my list of prams’ pros and cons. They are suitable from birth up to 6-9 months – babies grow sooo fast, so you should make a good use of this time! I hope my ranking of the best newborn prams and buying guide were helpful for you. If you’re still hesitating which model is right for your baby – let me know in the comment section below. 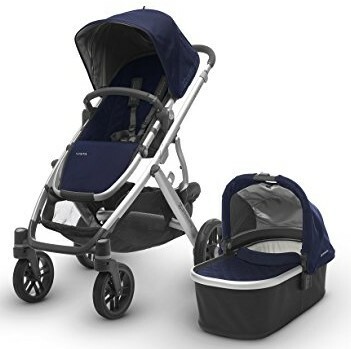 You can also check my ranking of other top-quality strollers of 2019. Source of pictures: each brand’s official website. Pictures of Roan Rocco Classic Pram belong to Roan. Pictures of Evenflo Pivot Modular belong to Evenflo. Pictures of UPPAbaby VISTA belong to UPPAbaby. Pictures of Joolz Hub belong to Joolz. Pictures of Nuna Demi Grow belong to Nuna. Pictures of Bugaboo Donkey2 belong to Bugaboo. Pictures of Silver Cross Balmoral Pram belong to Silver Cross. Hi! 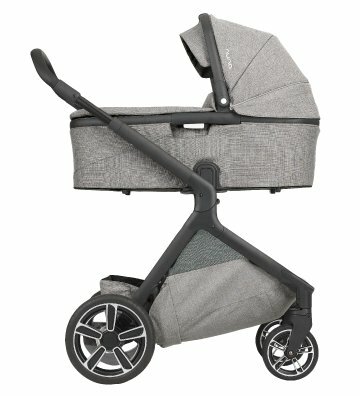 Could you please give me your recommendations about the stroller? I’m looking for the stroller with bassinet, for traveling with newborn baby to the sandy beach. So I need a good flat bassinet, it should be good for the airplane and has big wheels for the beach. With our first kid we had Chicco 3in1, with 3 big wheels and bassinet, but now they don’t sell this model anymore. 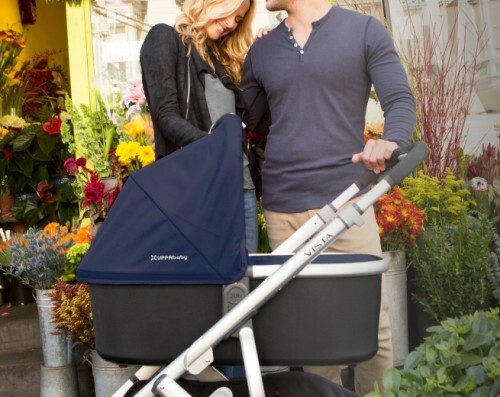 You may want to check Bumbleride Indie stroller with additional bassinet. There is also an option of using this stroller for newborn baby without the bassinet, because you can fully recline the backrest and lift the leg rest to create a enclosed space that looks a bit like a cocoon. Indie has good wheels with large pumped tires which should be sufficient for the beach. Of course you won’t be able to take it on board on the plane and fit in overhead compartment – the fold is compact but it’s not an umbrella stroller 🙂 But you can always check it at the gate. I agree with you, There are wide range of baby prams available in the market so it is really tough to purchase the best one for baby. Thanks for sharing this useful guide, Appreciate it..! !